UK Release Date - 12th July 1999. US Release Date - 24th May 1999. Format - CD/Promo 7 Inch. Special Formats - UK CD1 Enhanced CD featuring Promises video. Special Formats - European CD single featuring 'Under My Wheels'. Special Formats - US 7 Inch Jukebox Promo featuring 'PSSOM'. The first single from 'Euphoria' was released in July 1999. 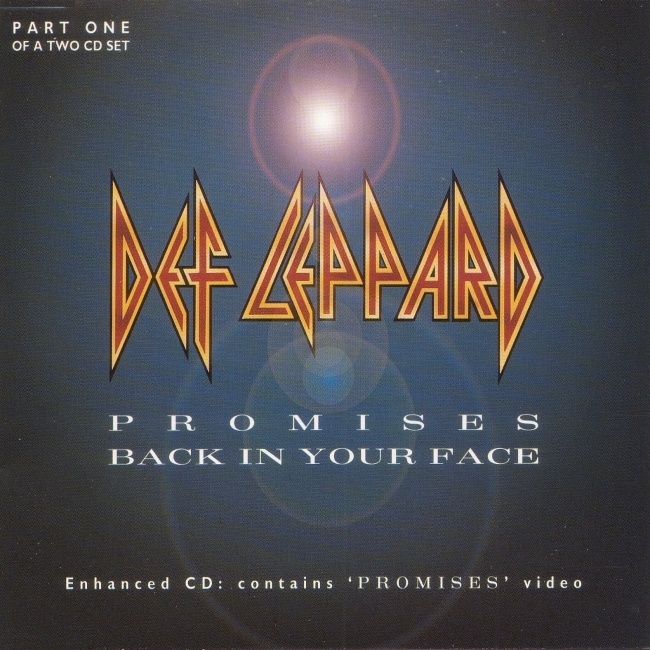 'Promises' was the first single and only major hit from the album. It did well on the US rock charts. It failed to reach the UK Top 40 due to the single being released weeks after the album had been out and therefore not capitalising on good pre-album press and a high profile TV appearance. It still managed to reach number 41. This was the first and only UK single to be a Double A-Side. The UK 2CD featured an enhanced CD1 plus album snippets of three tracks. CD2 had 'Back In Your Face' as the lead song and a new B-Side called 'World's Collide' that sounds like an out-take from the 'Slang' album. The European single also featured 'Under My Wheels'. The UK CD1 was enhanced with the promo video. A black screen appears with a promo pic of the band in the center of the screen and the video with control options in the middle. The video is an 67.9mb .mov quicktime file. The screen also shows options to read the Euphoria biography and the song lyrics which display with a screenshot from the video as a backdrop. "The version on 'Humanary Stew' sounds awful, so we've gone in and done a complete remix."